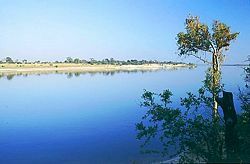 The Zambezi (also spelled Zambesi) is the fourth-longest river in Africa, and the largest flowing into the Indian Ocean. The area of its basin is 606,000 square miles (1,570,000 square kilometers), slightly less than half that of the Nile. 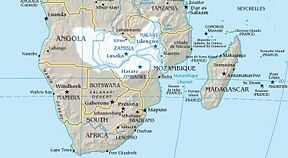 The 1,600-mile-long (2,574 kilometers) river has its source in Zambia and flows through Angola, along the border of Namibia, Botswana, Zambia, and Zimbabwe, to Mozambique, where it empties into the Indian Ocean. The Zambezi's most spectacular feature is Victoria Falls, the world's largest waterfall. Other notable falls include the Chavuma Falls, at the border between Zambia and Angola, and Ngonye Falls, near Sioma in western Zambia. Over its entire course, the Zambezi is spanned by several bridges, including those at Chinyingi, Katima Mulilo, Victoria Falls, Chirundu, Caia, and Tete. Electricity is generated by two main sources of hydroelectric power on the river. These are the Kariba Dam, which provides power to Zambia and Zimbabwe, and the Cabora-Bassa Dam in Mozambique, which provides power to South Africa. There is also a smaller power station at Victoria Falls. The Zambezi highlights the need to balance very real human needs in the present with the urgency of preserving for the future the very aspects of the river that make it unique. The Zambezi is one of the finest and least spoiled rivers in the world. Its basin has many important ecosystems and habitats: wetlands, riverine woodlands, montane forests, dry forests, savannahs, and aquatic ecosystems. Its wide diversity of species includes black rhinoceros, elephant, cheetah, lion, leopard, crocodile, lechwe, over six hundred bird species, and a great diversity of trees and plants. The basin has some of Africa's finest national parks, and many valuable species, ecosystems and wilderness areas survive outside these parks as well. Nevertheless, cash-poor nations have sometimes focused on tourism development without proper planning, leading to degradation of such sites as Victoria Falls. 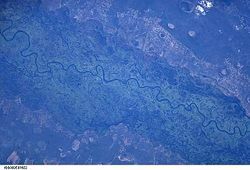 The Zambezi River rises in a black marshy bog in northwestern Zambia, in undulating forested hills about 4,900 feet (1,500 meters) above sea level. Eastward of the source, the watershed between the Congo and Zambezi basins is a well-marked belt of high ground, falling abruptly north and south, and running nearly east-west between 11 and 12° South. This distinctly cuts off the basin of the Luapula River (the main branch of the upper Congo) from that of the Zambezi. Near the source, the watershed is not as clearly defined, but the two river systems do not connect. After flowing to the southwest for about 150 miles(240 kilometers), the river turns south and is joined by many tributaries. A few miles above Kakengi, the river widens from 330 to 1,150 feet (100 to 350 meters), and below Kakengi are a number of rapids ending in the Chavuma Falls, where the river flows through a rocky fissure. The first of its large tributaries to enter the Zambezi is the Kabompo River in the northwestern province of Zambia. A little farther south is the confluence with the much larger Lungwebungu River. The savanna through which the river has flowed gives way to a more open bush valley, studded with Borassus palm trees. Dense vegetation is confined to narrow strips of matted forest that skirt the first few hundred meters of the sources of the Zambezi and its tributaries during the first 100 miles (160 kilometers). From 4,900 feet (1500 meters) at the source, the river drops to about 3,600 feet (1100 meters) at Kakengi, 220 miles (350 kilometers) downstream. From this point until the Victoria Falls, the level of the basin is very uniform, dropping only by another 590 feet (180 meters). Nineteen miles (30 kilometers) below the confluence of the Lungwebungu the country becomes flat, and in the rainy season is largely covered by floods. Fifty miles (80 kilometers) farther down, the Luanginga, which with its tributaries drains a large area to the west, joins the Zambezi. A few kilometers higher up on the east the main stream is joined by the Luena. A short distance downstream of the confluence with the Luanginga is Lealui, one of the capitals of the Lozi people who populate the semi-autonomous Zambian region of Barotseland. The chief of the Lozi has two compounds, the other being at Limulunga. Limulunga is on high ground and serves as the capital during the rainy season. The annual move from Lealui to Limulunga is a major event, celebrated as one of Zambia's best-known festivals, the Kuomboka. After Lealui, the river turns to the southeast. From the east it continues to receive numerous small streams, but on the west is without tributaries for 150 miles (240 kilometers), when the Cuando River joins it. Before this, the Ngonye Falls and subsequent rapids interrupt navigation. South of Ngonye Falls, the river briefly borders Namibia's Caprivi Strip. The strip projects from the main body of Namibia and results from the colonial era: it was added to German South-West Africa expressly to give Germany access to the Zambezi. 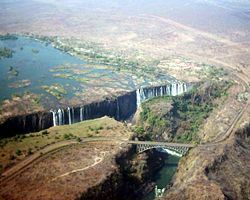 The Zambezi River's most spectacular feature is Victoria Falls, which divide the upper and middle sections of the river. Below the junction of the Cuando and the Zambezi the river bends almost due east. Here, the river is very broad and shallow and flows fairly slowly, but as it flows eastward toward the border of the great central plateau of Africa it reaches a chasm into which the Victoria Falls plunge. The Victoria Falls are considered the boundary between the upper and middle Zambezi. Below them the river continues to flow due east for about 120 miles (200 kilometers), cutting through perpendicular walls of basalt 65 to 200 feet (20 to 60 meters) apart in hills 650 to 820 feet (200 to 250 meters) high. The river flows swiftly through the gorge, the current being continually interrupted by reefs. Beyond the gorge are a succession of rapids, which end 150 miles (240 kilometers) below Victoria Falls. Over this distance, the river drops 820 feet (250 meters). At this point, the river enters Lake Kariba, created in 1959 following completion of the Kariba Dam. The lake is one of the largest man-made lakes in the world, and the hydroelectric power-generating facilities at the dam provide electricity to much of Zambia and Zimbabwe. The Luangwa and the Kafue are the two largest left-hand tributaries of the Zambezi. The Kafue joins the main river in a quiet, deep stream about 590 feet (180 meters) wide. From this point the northward bend of the Zambezi is checked and the stream continues due east. At the confluence of the Luangwa (15° 37' South) it enters Mozambique. The middle Zambezi ends when the river enters Lake Cahora Bassa (also spelled Cabora Bassa). Formerly the site of dangerous rapids known as Kebrabassa, the lake was created in 1974 by the construction of the Cahora Bassa Dam. The lower Zambezi's 400 miles (650 kilometers) from Cahora Bassa to the Indian Ocean is navigable, although the river is shallow in many places during the dry season. This shallowness arises as the river enters a broad valley and spreads out over a large area. Only at one point, the Lupata Gorge, 200 miles (320 kilometers) from its mouth, is the river confined between high hills. Here it is scarcely 200 meters wide. Elsewhere it is from 3 to 5 miles (5 to 8 kilometers) wide, flowing gently in many streams. The river bed is sandy, and the banks are low and reed-fringed. At places, however, especially in the rainy season, the streams unite into one broad fast-flowing river. 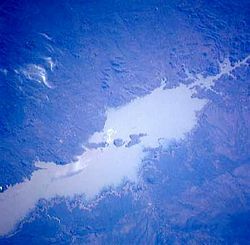 About 100 miles (160 kilometers) from the sea the Zambezi receives the drainage of Lake Malawi through the Shire River. 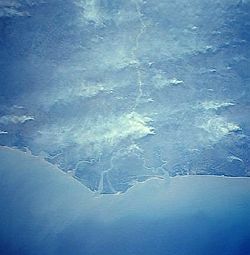 On approaching the Indian Ocean, the river splits up into a number of branches and forms a wide delta. Each of the four principal mouths, Milambe, Kongone, Luabo, and Timbwe, is obstructed by a sand bar. A more northerly branch, called the Chinde mouth, has a minimum depth at low water of two meters at the entrance and four meters farther in, and is the branch used for navigation. Sixty miles (100 kilometers) farther north is a river called the Quelimane, after the town at its mouth. This stream, which is silting up, receives the overflow of the Zambezi in the rainy season. The delta of the Zambezi is today about half as broad as it was before the construction of the Kariba and Cahora Bassa dams controlled the seasonal variations in the flow rate of the river. The region drained by the Zambezi is a vast broken-edged plateau 900–1,200 meters high, composed in the remote interior of metamorphic beds and fringed with the igneous rocks of the Victoria Falls. At Shupanga, on the lower Zambezi, thin strata of grey and yellow sandstones, with an occasional band of limestone, crop out on the bed of the river in the dry season, and these persist beyond Tete, where they are associated with extensive seams of coal. Coal is also found in the district just below Victoria Falls. Gold-bearing rocks occur in several places. The Zambezi has numerous tributaries. Some of the more important ones are described here, in order from source to sea. 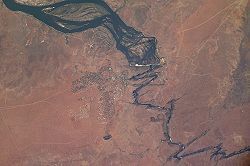 The Kabompo rises in the high land that forms the eastern watershed between the Zambezi and Congo systems. It is formed itself by the confluence of the upper Kabompo and the somewhat larger Lunga River, and flows into the Zambezi north of the town of Lukulu. The Lungwebungu, which enters the Zambezi from the west just south of the confluence with the Kabompo River, is 200 meters wide in its upper course, flowing in a valley bordered by white sand covered in thin forest, its floor forming at times an inundated plain two to three miles wide. The Cuando River, largest of the river's western tributaries, has the ruined capital of the Makololo people on its lower reaches. It rises in Angola and forms the border between Zambia and Angola for part of its course, before curving to the south, then flowing east into the Zambezi. In this eastward stretch the Cuando flows through a vast reedy swamp studded with alluvial islands for 70 miles (110 kilometers), and at its most southern bend is joined by the Magwekwana, which in time of flood receives some of the surplus water of the Okavango. This surplus water, received after most of the flood water of the Cuando has passed, raises the level of the lake and holds up the waters of the Cuando for some miles above it. The largest tributary of the middle Zambezi, the Kafue, rises in Zambia's Copperbelt Province near the border with Democratic Republic of the Congo at an elevation of 1,350 meters in thick forest country. The main headstream is later joined by the Lunga River or Luanga. The Itezhi-Tezhi Dam is an important source of hydroelectric power from the Kafue River, and the river also supports a great deal of wildlife, which is protected by Zambia's largest national park, Kafue National Park. The lower Kafue has a series of waterfalls and cataracts, dropping several hundred feet in 15 miles (25 kilometers). The next large tributary to the east is the Luangwa, which rises near the northwest corner of Lake Malawi and in its upper course runs parallel to its western shores. The Luangwa flows in a generally level valley, bounded by steep plateau escarpments, and is generally shallow and rapid, though fairly wide. Its tributaries the Lunsemfwa River and Lukasashi River drain a large area of the western plateau of Zambia. The Luangwa joins the Zambezi a little above the town of Zumbo. The Luangwa Valley is an important wildlife conservation area, and contains North Luangwa National Park and South Luangwa National Park. The Luangwa defines the border between Zambia and Mozambique for about 75 kilometers before it joins the Zambezi. From the south the middle Zambezi receives various rivers which water northern Zimbabwe—the Shangani, Sanyati, and Hanyani, besides minor streams. The Mazoe, which rises in Mashonaland, joins the Zambezi below the Cahora Bassa Dam. The Zambezi region was known to medieval geographers as the Empire of Monomotapa, and the course of the river, as well as the position of lakes Ngami and Nyasa, were given broadly accurately in early maps. These were probably drawn from Arab information. The first European to visit the upper Zambezi was David Livingstone in his exploration from Bechuanaland between 1851 and 1853. Two or three years later, he descended the Zambezi to its mouth and in the course of this journey discovered Victoria Falls. During 1858–1860, accompanied by John Kirk, Livingstone ascended the river by the Kongone mouth as far as the falls and also traced the course of its tributary the Shire and reached Lake Malawi. For the next 35 years, very little exploration of the river took place, but in 1889 the Chinde channel north of the main mouths of the river was discovered. Two expeditions led by Major A. St Hill Gibbons in 1895-1896 and 1898-1900 continued the work of exploration begun by Livingstone in the upper basin and central course of the river. Portuguese explorer Serpa Pinto examined some of the western tributaries of the river and made measurements of Victoria Falls in 1878. The river supports large populations of many animals. Hippopotamuses are abundant along most of the calm stretches of the river, and many crocodiles are also present. Monitor lizards are found in many places. Bird life is abundant, with species including heron, pelican, egret, and African fish eagles present in large numbers. Riverine woodland also supports many large animals, such as buffalo, zebras, giraffes, and elephants. However, below Kariba and Cahora Bassa dams, the cessation of annual flooding has seen the area of this habitat greatly reduced and a corresponding reduction in the populations of the large mammals. The Zambezi also supports several hundred species of fish, some of which are endemic to the river. Important species include cichlids which are fished heavily for food, as well as catfish, tigerfish, yellowfish, and other large species. The bull shark is sometimes known as the Zambezi shark after the river but is found around the world. It normally inhabits coastal waters but has been found far inland in many large rivers, including the Zambezi. It is an aggressive shark that has been responsible for several attacks on humans. The population of the Zambezi River valley is estimated to be about 32 million. About 80 percent of the population of the valley is dependent on agriculture, and the upper river's flood plains provide good agricultural land. Communities by the river fish extensively from it, and many people travel from far afield to fish. Some Zambian towns on roads leading to the river levy unofficial "fish taxes" on people taking Zambezi fish to other parts of the country. As well as fishing for food, game fishing is a significant activity on some parts of the river. Between Mongu and Livingstone, several safari lodges cater to tourists who want to fish for exotic species, and many also catch fish to sell to aquaria. The river valley is rich in mineral deposits and fossil fuels, and coal mining is important in places. The dams along its length also provide employment for many people near them, in maintaining the hydroelectric power stations and the dams themselves. Several parts of the river are also very popular tourist destinations. Victoria Falls receives over 1.5 million visitors annually, while Mana Pools and Lake Kariba also draw substantial tourist numbers. The river is frequently interrupted by rapids and therefore has never been an important long-distance transport route. Along short stretches, however, it is often more convenient to travel by canoe along the river rather than on the unimproved roads that are often in very poor condition due to being regularly submerged in flood waters. Many small villages along the banks of the river are only accessible by boat. At many locations pontoons still ferry people and vehicles across the river. Road, rail and other crossings of the river, once few and far between, are now proliferating. 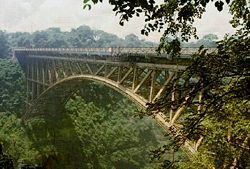 Victoria Falls Bridge was the first to be built and was completed in April 1905. It was initially intended as a link in Cecil Rhodes' plan to build a railway from Cape Town to Cairo. The bridge is 820 feet (250 meters) across, with a main arch spanning 490 feet (150 meters), and the top of the bridge is 410 feet (125 meters) above the low-water level of the river. Later bridges were constructed at Chirundu in Zambia (1939, replaced in 2003), Tete in Mozambique (1960s), and Chinyingi in northern Zambia in the 1970s (footbridge only). In 2004, a bridge crossing the river from Sesheke in Zambia with Katima Mulilo in Namibia was completed, the last part of the Trans Caprivi Highway and connecting Lusaka in Zambia with Walvis Bay on the Namibian coast. A road bridge at Caia has been constructed to replace the Caia ferry. Sewage effluent is a major cause of water pollution around urban areas, as inadequate water treatment facilities in all the major cities of the region force them to release untreated sewage into the river. This has resulted in eutrophication of the river water and has facilitated the spread of diseases of poor hygiene such as cholera, typhus, and dysentery. The construction of two major dams regulating the flow of the river has had a major effect on wildlife and human populations in the lower Zambezi region. When the Cahora Bassa Dam was constructed in 1973, its managers allowed it to fill in a single flood season, going against recommendations to fill over at least two years. The drastic reduction in the flow of the river led to a 40 percent reduction in the coverage of mangroves, greatly increased erosion of the coastal region, and a 60 percent reduction in the catch of prawns off the mouth due to the reduction in emplacement of silt and its associated nutrients. Wetland ecosystems downstream of the dam shrank considerably. Bento, C. M., and R. Beilfuss. 2003. Wattled Cranes, Waterbirds, and Wetland Conservation in the Zambezi Delta, Mozambique. Report for the Biodiversity Foundation for Africa for the IUCN - Regional Office for Southern Africa: Zambezi Basin Wetlands Conservation and Resource Utilisation Project. Bourgeois, S., T. Kocher and P. Schelander. 2003. Case study: Zambezi River Basin. ETH Seminar: Science and Politics of International Freshwater Management 2003/2004. Davies, B. R., R. Beilfuss and M. C. Thoms. "Cahora Bassa Retrospective, 1974–1997: Effects of flow regulation on the Lower Zambezi River." Verh. Internat. Verein. Limnologie 27 (2000): 1-9. Dunham, K. M. "The effect of drought on the large mammal populations of Zambezi riverine woodlands.” Journal of Zoology 234 (1994): 489-526. Wynn, S. "The Zambezi River - Wilderness and Tourism." International Journal of Wilderness 8 (2002): 34. Zambezi Society Conservation Group. Retrieved July 12, 2007. This page was last modified on 5 July 2013, at 16:24.